Missed the boat: Crystal Bennes reviews Scottish Opera’s new commission about scientists on a research expedition to Greenland. If Anthropocene were a consumer good, one suspects it might be subject to close scrutiny from the Consumer Protection Association for mis-selling. Despite its title, the opera—the result of a long-term collaboration between writer Louise Welsh and composer Stuart MacRae—has almost no connection with climate change beyond an absurdly heavy-handed metaphor. 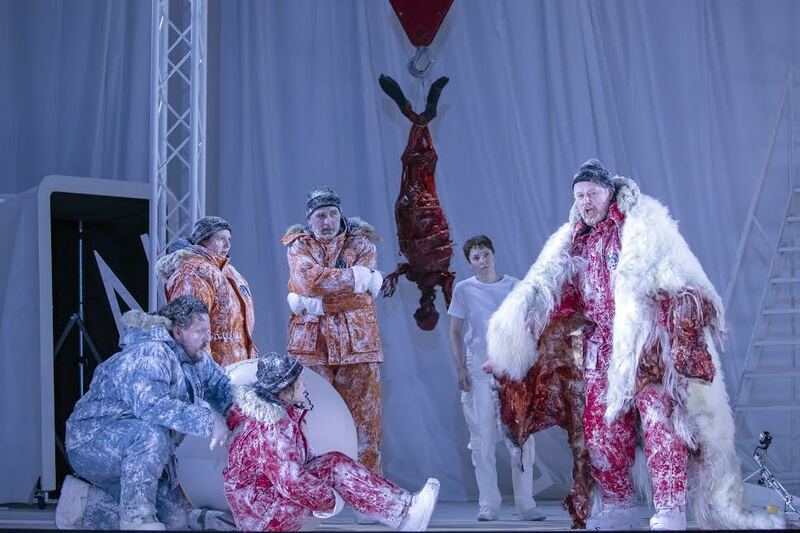 The opera’s action takes place on a boat off the coast of Greenland after it becomes stuck in the ice. The name of the boat is… Anthropocene. Anthropocene belongs to Harry King, a wealthy businessman who has funded a research expedition to bring a team of scientists—Professor Prentice and her husband Charles—to collect samples of ancient ice. Accompanying the trio are King’s photographer daughter Daisy and a journalist named Miles, both of them there to document the expedition. The expedition team is rounded out by Ross, the ship’s captain, and his crew member Vasco. In operatic terms, Anthropocene’s characterisation and plotting depart little from pre-twentieth-century repertoire’s standard fare. There’s an excess of ambition, romance, duplicity, rivalry and machismo; even a bit of murder thrown in for good measure. Characters are caricatures, which wouldn’t perhaps be an issue if the plot consisted of more than people stuck on a boat shouting at each other. The twist in this otherwise ordinary melodrama comes in the form of a block of ice. Or, more precisely, a woman frozen in the block of ice. Ice woman is miraculously resurrected, as an analogue time-traveller whose links to climate change play out through tales of ancient sacrifice rather than contemporary politics. Tellingly, the programme’s contextualising essay is called ‘Sacrifice: Then and Now’. Not sacrifice like ‘stop eating meat’; but sacrifice like ritual sacrifice, sacrifice like death. Perhaps even more tellingly, it seems that Scottish Opera commissioned a programme essay from philosopher Timothy Morton on opera in the Anthropocene but then decided not to publish because it was “too controversial”—Morton’s words, not mine. It may have been that the essay was commissioned before Scottish Opera realised that the opera they’d commissioned actually had nothing to do with climate change thus rendering Morton’s essay irrelevant. Who knows. Although there are some lovely passages in MacRae’s score — particularly, a welcome surprise, passages exclusively featuring voices in the upper registers—these bright spots are not enough to carry the production. As a dedicated opera-goer, although I’m hugely keen to encourage financial support for new commissions, Anthropocene feels like a real missed opportunity. This could have been an opera that delved into the peculiar controversies surrounding the proposed naming of the current geological epoch. Or a futuristic tale exploring the implications of decision making based on polarised interpretations of scientific facts in a ‘post-truth’ society. Frankly, there’s enough drama to be found in the helplessness engendered in many when thinking about the future of our planet to power a dozen operas. While I appreciate that companies are ever in search of new ways to generate advance publicity and bring in fabled new audiences, promising one thing and delivering another is as disingenuous as it is disappointing. Anthropocene was at King’s Theatre Edinburgh from 31 January-2 February. It transfers to Hackney Empire from 7-9 February. More info here.